​When you are ready to climb as high as you like with poles that deliver nearly effortless performance due to their lightweight construction and ergonomic grips, MUDDY BEAR Ultra Lightweight Trekking Poles are a good choice. You may be pleasantly surprised to discover that this affordable pair of poles is just what you need for hiking, trekking, or walking. They deliver everything you need to enjoy your next adventure - reliable performance, easy transport, and joint support. ​MUDDY BEAR Ultra Lightweight Trekking Poles deliver an excellent choice for novices and experienced hikers alike. Whether you are just starting out or looking for a spare pair of poles to use, this aluminum set delivers reliability. The price is affordable and much lower than many of the expensive options available on the market today. A twist lock mechanism allows you to easily adjust the height of your poles, making them suitable for individuals of various heights. This particular style is sold in pink as well as black, giving ladies a choice to add some color to their hiking adventures. ​With your purchase of MUDDY BEAR Ultra Lightweight Trekking Poles, you receive exceptional value for your money. You receive a pair of lightweight aluminum poles and a black carry bag with a convenient handle. The poles are styled with natural cork handles, and the wrist straps are padded for extra comfort. ​The package also includes extra rubber tip and instructions. ​You can move easily with these lightweight trekking poles styled for comfort and durability. They are crafted from an aluminum alloy that is stronger than carbon fiber. The poles dependability is complemented by stability, which allows the poles to stay in place when you need to put your weight on them during your trek. The anti-shock springs help to cushion each step that you take, keeping the strain away from your joints and knees. You can hike for hours as long as your stamina lasts. The ergonomic fit of natural cork handles accompanied by padded and adjustable wrist straps provide superior comfort on your journey. You never need to worry about sweat, because the natural cork absorbs most of it for you. As a result, the grips minimize the risk of chafing. The twist locks deliver a secure setting that remains in place even while you are trekking across rugged terrain. The lock stays in place even if you have to apply the pressure of your weight onto the poles to manage your climb. Each lock allows you to adjust the height of the poles, making it easy to switch pole length as you meet up with changes in slope or terrain. When you need to climb hills, the carry bag allows you to keep your hands free for the challenge. It can also helps to keep your car clean when returning from your latest adventure. This set of trekking poles weighs only 1.2 pounds total and is available in two colors - black and pink. Be sure to use your new trekking poles during the first six months that you own them, because MUDDY BEAR offers a 100% money-back guarantee during that time. ​Your new trekking poles are easy to use. You simply take your poles out of the packaging and set your desired height. Keep in mind that your poles should reach up as high as your shoulders. Just twist the lock to adjust your setting, tightening it once you are happy with your choice. When you want to adjust the straps on the poles, look for the non-looped strap and pull. This action releases a small pin that you simply push back into place once you make your adjustment. ​If you aren't comfortable with the lack of accessories, you may want to consider Cascade Mountain's Tech Folding Trekking Poles. This set contains a carrying case, snow basket, solid basket, small rubber feet, boots tips, and instruction booklet. It's a nice set of hiking poles, especially if you are also interested in carbon-fiber construction rather than aluminum. These poles offer a lightweight construction along with durability. The handles are crafted from cork, allowing them to readily absorb excess sweat during hot-weather treks. 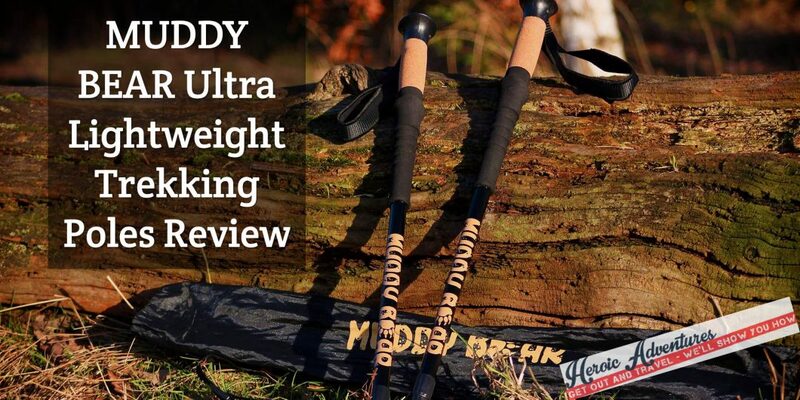 ​MUDDY BEAR Ultra Lightweight Trekking Poles are affordably priced, making them the perfect choice for anyone. Whether you are just starting out on trekking adventures or you are an avid hiker, these poles deliver the kind of dependable gear you'll want. While this set is clearly a no-frills option without a lot of accessories, it has exactly what you need to hike, climb, and walk on varying types of terrain. The twist lock provides a secure setting whenever you need to adjust the height of your poles. The anti-shock springs protect your joints. The natural cork grips absorb your seat, while their ergonomic styling fits your hand perfectly. What more could you possibly need?